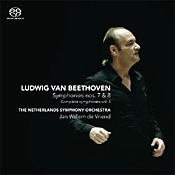 Jan Willem de Vriend, The Netherlands Symphony Orchestra. Challenge Classics SACD CC72500. Although we get quite a few recordings of the Beethoven Seventh and Eighth Symphonies, often coupled together, we don't get too many recorded in SACD multichannel stereo. Therefore, for fans of the SACD medium, as well as for fans of Beethoven, we can welcome this Challenge Classics disc with the Netherland Symphony Orchestra. Interestingly, it was just a few years ago that we got the same coupling from conductor Bertrand de Billy and the Vienna Radio Symphony Orchestra on an OehmsClassics SACD. Maybe that SACD recording succeeded well enough to prompt this one, I don't know. In any case, the Netherlands Symphony Orchestra uses select period instruments, and Jan Willem de Vriend, its chief conductor since 2006, follows period-music practices to help make eighteenth and nineteenth-century works seem as close as possible to how they may have originally sounded. The results are not quite like those of a full-on period-instruments ensemble, but they're close enough. Things begin with the Symphony No. 7 in A major, Op. 92, which Ludwig van Beethoven (1770-1827) wrote in 1812 and has since become one of his most-popular pieces. De Vriend opens the symphony with as vigorous and dashing a delivery as anybody could want, with kudos here to the percussion section who hammer this one home in high style. In the ensuing Allegretto, interpreted either as a funeral march or a procession through the catacombs, the conductor again provides a highly rhythmic beat, moving a little faster than we may be accustomed to hearing and emphasizing the dynamic contrasts more than ever. It makes an imposing statement. In the Presto, De Vriend is again fleet-footed, apparently taking Beethoven's tempo markings at face value and working up a healthy head of steam. The final movement is justifiably one of the great triumphs of jubilant merrymaking in music, and De Vriend produces a considerable amount of ebullient energy. This Seventh is among the finest I've heard in some time, and while it breaks no new ground, it surely conjures up wonderfully high spirits. Beethoven wrote his Symphony No. 8 in F major, Op. 93, in the summer of 1812, finishing it just shortly after he completed the Symphony No. 7. You'd think by its cheerful tone that the composer was in the best, happiest years of his life when he wrote this pair of symphonies when, in fact, both physical and emotional strains were troubling him. Whatever, the Eighth has always taken something of a backseat to the two great symphonies that sandwich it front and back. Still, it's remarkably bubbly and exuberant. Under De Vriend, the Eighth is amiable and festive, its forward thrust always pointed and right, its mood always buoyant, if not always as sweet as it might be. The second-movement ticking of the metronome (legend has it that Beethoven was paying tribute here to the inventor of the instrument) moving at a brisk but somewhat perfunctory gait. The third movement is appropriately stately and the finale joyous. Nevertheless, this performance of the Eighth seems more like one to admire rather than to love. In terms of sound, the Challenge Classics engineers recorded the performances at Muziekcentrum Enschede, Netherlands, in 2008 (No. 8) and 2010 (No. 7). In both works, the company provide nicely balanced SACD sonics, which the listener may play either in two-channel stereo as I did or in multichannel if you have the appropriate playback equipment. In two-channel stereo, the sound is excellent: vibrant, detailed, and dynamic. The stereo spread is quite wide, and the sonics make a strong impact, with decent bass, extended highs, and a clean midrange. Moreover, a sense of stage depth adds to the realism. The sound may be big, yet it's not overwhelming; it's just the right size and breadth to allow listeners to feel as though they are at the performance. A good separation of instruments without sounding compartmentalized, a feeling of air, and a mild hall resonance continue the illusion. Piano Concerto No. 1; various solo pieces. Lang Lang, piano; Valery Gergiev, Vienna Philharmonic. Sony Classical 88697891402 (with bonus DVD). In the past twenty-odd years Chinese pianist Lang Lang has become something of a phenomenon, an international superstar beloved of millions of classical and nonclassical fans alike. In the booklet note to the 2011 album reviewed here, Liszt: My Piano Hero, he says his greatest inspiration as a pianist was watching a Tom and Jerry cartoon featuring Liszt's Hungarian Rhapsody No. 2. Lang goes on to say, "Liszt is my hero! He changed classical music completely. As a performer he revolutionised piano playing, and as a composer he opened the door to modern music. As a teacher he was influential well into the 20th century, because many great artists were pupils of his pupils, or their pupils in a third generation." Fair enough, and Lang proves his admiration for the composer by devoting the album to an almost all-Liszt program of solo and concerto works. The disc begins with a series of short solo numbers by the subject of the album, Hungarian composer and pianist Franz Liszt (1811-1886). Lang Lang alternates slow and fast pieces, soft and loud, playing them delicately, brilliantly, or showily as the occasion dictates, with all the passion and feeling we figure on from him, though never overdone. The opening Romance in E minor, for instance, is sweetly evocative. La Campanella in G-sharp minor is sprightly and strong. The Consolation No. 3 in D-flat major is aptly melancholy and moody. Then the Grand Galop chromatique in E-flat major does just that: gallop across the sound stage in high spirits. And so it goes, with the celebrated Lieberstraum No. 3 in A-flat major as dreamy as ever and Lang adding just the right amount of gravity and weight to it to make it seem more than just light filler. After a couple of rousing Hungarian Rhapsodies for Piano (Nos. 6 and 15), Lang briefly forsakes Liszt for Schubert (Ave Maria) and returns for Liszt's piano transcription of Wagner's Liebestod from Tristan und Isolde. The CD ends with the Piano Concerto No. 1 in E-flat major, which under Lang is every bit as heroic and triumphant as we expect it to be. Here, we find Lang Lang supported by Valery Gergiev and the Vienna Philharmonic, one of the world's genuinely great orchestras. The result is taut and romantic, with perfectly judged tempos and emotionally charged phrases. It's a moving, stirring, engaging interpretation, including a wonderfully lyrical and flowing central movement and a chipper finale. So how does the relatively young (as of this writing, he had not yet turned thirty) Lang Lang stack up against some of his more-illustrious older colleagues: Argerich, Ashkenazy, Brendel, Kovacevich, Pollini, and the like (or even those closer to his age like Kissin, Grimaud, Pletnev, and the rest)? 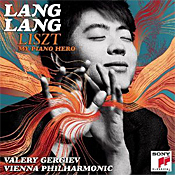 Well, Lang is surely more flamboyant than most, even in so toned down an album as this one of Liszt. It remains for us to see how well Lang's rock-star celebrity status will hold up in the long run, say in another thirty years. Anyway, in addition to the compact disc, the Digipak set includes a bonus DVD titled A Day with My Piano Hero, about eleven-and-a-half minutes, which follows the pianist as he practices, plays, and fusses about the album he's making. This one is for dedicated Lang Lang fans only. The sound of the piano solos, recorded in April, 2011, at Teldex Studio, Berlin, Germany, is excellent, the piano appearing firm and glowing yet with good detail, clarity, and impact. It's an exceptionally realistic recording, miked at a moderate distance that doesn't stretch the instrument across one's listening area, while easily filling the room with a pleasantly ambient acoustic. Note, however, that because the music displays a wide dynamic range, you may find yourself having to readjust the volume on occasion. It's a small price to pay for the realism of the presentation. Sony recorded the Piano Concerto in concert in June, 2011, at the Musikverein, Vienna, Austria, and here things are not quite as good as the studio solos. In order to minimize audience noise, the audio engineers recorded the Concerto rather closely, so the whole thing is kind of in our lap. Still, the miking provides a clean, fairly transparent sound without being hard, bright, or edgy. The sonics do, however, seem somewhat constricted in climaxes, the dynamics not expanding as we might hope. Nor are the frequency extremes, bass and treble, as extended as they might have been. Thankfully, the folks at Sony did not include any distracting audience noise or any final applause. Highlights include five world premiere pieces and fresh rendition of Goldberg Variations by Tepfer. North Bethesda, MD -- In December, Strathmore gives the gifts of rare classical interpretations of the Great American Songbook by pianist Jenny Lin, five world premieres from violist Wendy Richman, new music from prolific jazz pianist and composer Dan Tepfer and holiday favorites reimagined with a jazz bent during the Bohemian Caverns Jazz Orchestra: A Bohemian Christmas. Jenny Lin will perform on Thursday, December 1, 2011 at 7:30 p.m.; Wendy Richman can be heard on Thursday, December 8, 2011 at 7:30 p.m.; Dan Tepfer will perform on Thursday, December 15, 2011 at 7:30 p.m.; and Bohemian Caverns Jazz Orchestra can be heard on Sunday, December 18, 2011 at 5:30 and 7:30 p.m. Calendar information for each of the December Music in the Mansion concert is located at the end of this document. For more information or to purchase tickets, call (301) 581-5100 or visit www.strathmore.org. Strathmore's December concerts complement its Celebrating American Composers series, a sweeping year-long exploration of the dynamic talents and innovations that have shaped American music and its diverse genres. Music in the Mansion concerts are sponsored by Asbury Methodist Village. Additionally, the concerts with Jenny Lin and Wendy Richman are also sponsored by the Randy Hostetler Living Room Music Fund. Acclaimed classical pianist Jenny Lin will bring her "remarkable technical command" and "gift for melodic flow" (The New York Times) to memorable excerpts from the Great American Songbook, interpreting the music of seminal composers such as Rodgers and Hammerstein, Fats Waller, Stephen Sondheim and George Gershwin, among others. Her mastery of classical piano will be reflected in music theater mainstays such as The King and I, The Sound of Music, Sweeney Todd and Lady Be Good, inviting audiences to hear classic American song in new ways. 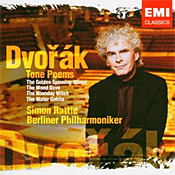 The "exceptionally sensitive pianist" (Gramophone Magazine) has been heard at venues such as Carnegie Hall, Avery Fisher Hall, Kennedy Center, Miller Theatre, MoMA, the Whitney Museum, San Francisco Performances, Freer Gallery of Art, Wordless Music Series, (Le) Poisson Rouge, National Gallery of Art, Corcoran Gallery and Spivey Hall; as well as Festivals worldwide at Lincoln Center Mostly Mozart, BAM's Next Wave, MATA and Spoleto in the U.S., Chopin Festival in Austria, Flanders and Ars Musica Festivals in Belgium, Shanghai New Music Festival in China and Divonne Festival in France. She has performed with conductors such as Lothar Zagrosek, James Bagwell, Jiri Starek, Urs Schneider, Alexander Mickelthwate, Peter Bay, Jac van Steen, Ovidiu Balan, Wen-Pin Chien, Kek-Tjiang Lim, John Kennedy, Oliver Diaz and Celso Antunes. The premiere pieces are part of her Vox/Viola project, an ongoing collaborative effort inviting young composers to write new works loosely inspired by Giacinto Scelsi's Manto III, tailored to Richman's training as a singer and violist. Jazz pianist and Yamaha artist Dan Tepfer will also premiere new works in the Mansion with his performance of Goldberg Variations / Variations, his kaleidoscopic solo album which uses Johann Sebastian Bach's totemic masterpiece, the Goldberg Variations, as an inspiring font for creativity. Interspersed with Tepfer's affectionate interpretation of the complete "Goldbergs" are his own improvised variations on Bach's variations. Goldberg Variations / Variations was released on November 8, 2011. Bach's Goldberg Variations are beloved now as an entrancing, virtually sacred work of art, and were published by Bach as of an "aria" and a set of 30 variations in 1741. Classic carols and holiday music will get new spin from Bohemian Caverns Jazz Orchestra, presenting Duke Ellington's adaptation of the Nutcracker Suite, new arrangements from the Stan Kenton and Claude Thornhill songbooks, as well as fresh arrangements of holiday classics by BCJO members. The new Bohemian Caverns Jazz Orchestra is a 17-piece big band founded by baritone saxophonist Brad Linde and co-directed by Linde and Joe Herrera. 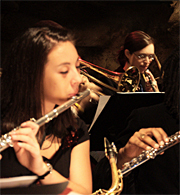 Debuted on April 19, 2010, the BCJO now presents a variety of music from big band literature and feature some of the District's best musicians on Monday nights at the historic Bohemian Caverns. Music from Ellington, Basie, Strayhorn, Thad Jones, Oliver Nelson, Maria Schneider and originals by band members embrace and challenge the tradition of big band repertoire. Oratorio and a Hanukkah Medley. Baltimore metropolitan area and its repertoire covers five centuries. select legal projects. He and his family reside in Montgomery County. The Music Institute of Chicago, one of the U.S.'s largest and most respected community music schools, offers a variety of events to entertain music lovers this December. Events are free unless otherwise noted and take place at Nichols Concert Hall, 1490 Chicago Avenue, Evanston. Saturday, December 10 at 7:30 p.m. Founded in 2006, the Music Institute of Chicago Academy has quickly established itself as an elite training center for highly gifted pre-collegiate musicians. The selective program is focused on providing a comprehensive musical education including a rigorous chamber music component. Wednesday, December 14 at 7:30 p.m. Led by conductor Larry Eckerling, the MIC Community Symphony features amateur adult musicians with prior orchestral experience. Hosted by John Piepgras and featuring Music Institute faculty pianist Matthew Hagle, the program includes Humperdinck's Prelude to Hansel and Gretel; Grieg's Piano Concerto in A Minor, Op. 16; and Haydn's Symphony No. 100 in G Major ("Military"). Thursday, December 15 at 7:30 p.m. Led by conductor Carolyn Merva Robblee, the New Horizons Band features amateur adult musicians, age 50 and older, with prior experience. Program TBA. Sunday, Dec 18 at 3 p.m. Led by conductor Daniel Wallenberg, the Music Institute of Chicago Chorale, celebrating its 25th anniversary, is a community chorus that offers adult singers with prior experience the opportunity to study and perform the best in sacred and secular choral music. Special guests include Jamie Dahman, tenor; Ben Melsky, harp; Rob Horton, organ; and the The Rogers Park and Humboldt Park Neighborhood Choirs of the Chicago Children's Choir. The program includes Ceremony of Carols, Hymn to Saint Cecilia, Te Deum in C, Flower Songs, A Boy was Born, Festival Te Deum, and Two-Part Songs for High Voices. Tickets: $15 adults | $10 seniors | $7 students; available at musicinst.org or 847.905.1500 ext. 108. Here Come the Classics, Volume Seventeen. Roderick Elms, piano; Jose Serebrier, Royal Philharmonic Orchestra. RPO 017 CD. 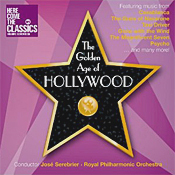 I didn't know this: The Royal Philharmonic's own RPO label has a series it's doing called "Here Come the Classics," and they're up to number seventeen, the current volume called "The Golden Age of Hollywood" and devoted, obviously, to the musical scores of classic movies. Conductor Jose Serebrier seems to be having a grand old time with the music, too, treating it as seriously as if it were Beethoven or Stravinsky and providing it with all the color and pizzazz it needs. The album contains fifteen tracks covering excerpts or suites from eleven films, all of them done up in fine fashion. As for the music, take your pick of favorite scores; here are a few of mine, starting with a nine-minute highlights suite from Max Steiner's Casablanca, with an emphasis on a piano fantasia based on "As Time Goes By," with pianist Roderick Elms. Another favorite of mine is a four-movement suite from Bernard Herrmann's music for Psycho. The disc provides four separate tracks for various themes--the Prelude, "The Stairs," "The Murder," and the finish. It all sounds quite effective, with Serebrier maintaining a vivid forward thrust. Eeek! Eeeek! Eeeeek! Next, Miklos Rozsa's "Parade of the Charioteers" from Ben-Hur is appropriately gaudy and grand. But probably the most-influential music in the set is Erich Wolfgang Korngold's score for the Errol Flynn film The Sea Hawk. The swashbuckling opening theme is so memorable, I doubt that we'd have half the music of John Williams without it. Then it's on to the movie hardly anyone remembers, Dangerous Moonlight, with the music almost everyone knows, Richard Addinsell's faux-romantic "Warsaw Concerto." Pianist Elms and Maestro Serebrier play it as though Liszt or Rachmaninov had written it, and again it impresses one with its melodic invention. The program ends with "Tara's Theme" from Max Steiner's score for Gone with the Wind and then Elmer Bernstein's Overture for The Magnificent Seven. In between these items, you'll also hear music from The Big Country, Spellbound, The Guns of Navarone, and Taxi Driver. Serebrier may be aging but he hasn't slowed down, his interpretations as vigorous as the movies' original soundtracks. The sound, recorded at Waterford Colosseum, London, in 2005 is very big and very wide to match the scope of the movies involved. There's a solid bottom end, if not too deep or strong; a slightly thick upper bass; a smooth midrange; and an extended if somewhat tizzy high end. The latter trait is an odd distraction in an otherwise fine sonic picture, and it left my ears ringing a little by the end of my listening session. The acoustic offers a reasonable sense of depth for the orchestra and a wide dynamic range, too, making a respectable showing on the audio side if you tone down the treble a bit. The catch came when I compared the RPO sound to a similarly themed album I had on hand, Film Spectacular! Vol. 2, a Decca Phase-4 recording from 1963. The older recording, although done up in a much more-expensive remastering from FIM, sounded clearer, cleaner, more dimensional, more dynamic, you name it. And it didn't leave my ears ringing. Maybe if you want the best, you pay for it. Finally, the RPO disc boasts a terrific set of booklet notes on each of the films and composers represented, which alone may be worth the price of the album. Music of Johann Sebastian, Carl Philippe Emanuel, and Johann Christian Bach. Sebastian Knauer, piano; Sir Roger Norrington, Zurich Chamber Orchestra. Berlin Classics 0300270BC. 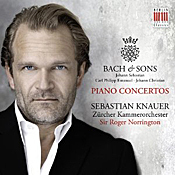 The concept behind the album Bach & Sons is to present similar music from two generations of Bachs, Johann Sebastian the father and Carl Philippe Emanuel and Johann Christian, two of his sons. The idea is not only to entertain with wonderful music but to point up the differences in musical styles from the late Baroque to early Classical periods. German pianist Sebastian Knauer, English conductor Sir Roger Norrington, and the Zurich Chamber Orchestra are more than happy to demonstrate these musical changes in four works by the family of composers. It doesn't hurt, either, that the disc shows off Maestro Norrington's credentials as the new principal conductor of the Zurich ensemble, bringing with him a firm grasp of period style and performance. The program starts with the Piano Concerto No. 1 in D minor, BWV 1052, by Johann Sebastian Bach (1685-1750), a work that began life as a violin concerto, which Bach then turned into a harpsichord concerto, and which Knauer here plays on piano. Knauer and Norringotn are clearly of a single mind about the interpretation, producing a recording of great vitality and increasing joy. Knauer's virtuosity is always on display (did Bach himself play as well, one wonders), yet it never overpowers the music. Next up comes the Piano Concerto in E major, Wq. 14 (1744), a work by Carl Philippe Emanuel Bach (1714-1788), J.S. 's son. A generation had passed and we see the music has grown and matured considerably, specifically in the use of a slightly larger ensemble, more dynamic contrasts, and more-sophisticated phrasing. C.P.E. Bach's piece simply sounds more modern, the piano exhibiting greater subtlety in its solo passages, and the whole work evoking a smoother, more harmonic tone than that of the father. Then, perhaps to point up these differences further, Knauer and company go back to Bach the elder for J.S. 's Piano Concerto No. 2 in E major, BWV 1053. This time Bach reused one of his organ concertos to remodel into the harpsichord concerto we get here on the piano. Of course, Bach added a good deal more elaboration to the solo piano part, which Knauer seems pleased to demonstrate. The program concludes with the Piano Concerto in E-flat major, Op. 7, No. 5 (1770) by the youngest Bach son, Johann Christian (1735-1782). Here we find a greater rapport between soloist and orchestra and fewer interludes between solo and orchestral parts than in the back-and-forth arrangements we hear from the father. There is also a greater dependence on thematic development within each movement, so with J.C. we're moving closer to Haydn and Mozart territory. Again, Knauer and Norrington show their affinity for the music and the style and offer up a silky smooth yet sparkling reading, the final movement particularly intoxicating. Recorded in 2011 in Zurich, ZKO-Haus, the sound is clean and well balanced, with the piano up front and personal. The relatively small group of players appears not too widely spread out behind the soloist, so it's not an especially spectacular recording, just a fairly natural one. Clarity is fine and definition solid, an appropriately proportioned resonance giving the music a lifelike feeling. It's all quite beautiful, actually, the recording and the music. That's one grim-looking picture of Mr. Knauer on the cover, though. Sir Simon Rattle, Berlin Philharmonic Orchestra. EMI 7243 5 58019-2 (2-disc set). There hasn't been a really good set in quite some time of Dvorak's four tone poems of 1896. The best ones appeared ages ago from Kertesz and the LSO (Decca), Kubelik the Bavarian RSO (DG), and Harnoncout and the Concertgebouw O. (Warner Classics). So it's good to have so refined and polished as set as this one from Sir Simon Rattle and the Berlin Philharmonic from 2005. The tone poems I'm referring to are The Golden Spinning Wheel, The Wood Dove, The Noonday Witch, and The Water Goblin. Dvorak wrote them toward the end of his career, after he'd made his mark with the nine symphonies and the Cello Concerto and what have you. He wanted to do something uniquely Czech, returning to Prague to compose these orchestral ballads based on folk songs collected by Prague archivist Karel Jaromir Erben. They are typical folk stories, very lurid and grisly as so many folk stories are. They mostly have to do with monsters eating people--young heroines and children--or in the case of The Wood Dove, a bird driving a woman to suicide. Yes, they're rather merciless, but think even of a child's fairy tale like "Hansel and Gretel" and you get the idea. No need for political correctness here nor any apologies. Rattle and his players handle the pieces in exemplary fashion, with plenty of color and atmosphere. If anything, though, his treatments may be a too sophisticated, too cultured, to capture fully the horrifying aspects of these tales. A quick listen to Kertesz, for example, reveals interpretations less subtle, less delicate, but more boisterous and more robust. This is to take nothing away from Rattle; his just seems to take a more urbane approach to such folky tunes. The real advantage of the new EMI set is the sound. What a pleasure it is to listen to the Berlin Philharmonic without an audience coughing, wheezing, and shuffling in the background. For most of the tenures of Claudio Abbado and Rattle they and their record companies have insisted upon recording almost everything with the BPO live, perhaps providing more spontaneous performances but compromising the sound. This time out, the orchestra was less distant and a whole lot fuller sounding. By comparison, the old Kertesz-Decca recordings, while still good, are brighter, harder, and more forward, with less mid bass response. The Rattle-EMI recordings are smoother overall, perhaps a touch too soft, and much better balanced tonally, with a sturdy if sometimes overly prominent mid bass. Also, aria from Idomeneo. Helene Grimaud, piano; Mojca Erdmann, soprano; Radoslaw Szulc, leader, Bavarian Radio Chamber Orchestra and Symphony. DG B0016204-02. Wolfgang Amadeus Mozart (1756-1791) was a musical prodigy on the piano, a child genius whose father dragged him all over Europe to play before kings and courts. It's no wonder, then, that Mozart would produce some twenty-seven piano concertos during his relatively short life. He seems to have been born to the genre. French pianist Helene Grimaud, who began playing the piano at the age of seven, also seems to have been born to the instrument. In the few recordings I've heard from her, she appears not only sensitive and virtuosic but more than willing to be herself as well, to reinterpret old favorites with new shadings of her own. Although I've not always agreed with her vision of things, I can certainly appreciate her desire not to be another sheep following every other pianist before her. If there wasn't room for a multitude of interpretations in musical performances, there would be no need for hearing more than one of anything. Ms. Grimaud begins the program with the Piano Concerto No. 19 in F major, K. 459, where she takes the opening Allegro vivace at its word with a vivacious tempo and characteristically imaginative phrasing. Then she makes the slow center movement all the more lovely for its straightforward simplicity and delicacy, wrapping things up with a snappy finale that seems only fitting. Between the album's two concertos, Ms. Grimaud chose to ask soprano Mojca Erdmann to sing "Ch'io mi scordi di te?" - "Non temer, amato bene" from Mozart's opera Idomeneo. The music makes a charming and wholly appropriate interlude in the proceedings. In the disc's final work, the Piano Concerto No. 23 in A major, K. 488, Ms. Grimaud tends to race through the Allegro, even if the orchestra wants clearly to take their time. Perhaps she wanted to get to the ravishing central Adagio all the more quickly. Certainly, there is no questioning the radiance of her playing here, the tenderness in every note. No doubt, too, her extra-slow pace in the Adagio contributes to a small diminution of lilt and lift; alas, it's all a trade-off, a compromise. 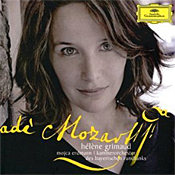 In the closing movement Ms. Grimaud is fleet, polished, and technically remarkable, if not quite so much fun as several of her colleagues, particularly Ashkenazy (Decca), Tan (Virgin), Curzon (Decca), Perahia (Sony), and Barenboim (EMI and BR Klassik). DG recorded the two concertos live at the Prinzregententheater, Munich, May, 2011 and the aria in the Residenz, Herkulessaal, July, 2011. The concertos are miked close enough to reduce most audience noise, but the sonics are still rather soft and a little hollow, with a good number of extraneous sounds from Ms. Grimaud's footwork perhaps or hall resonance, I don't know. It's a distraction in any case and just one of the drawbacks of recording live. Otherwise, the piano is well out in front of the orchestra and fairly well delineated, the orchestral accompaniment smooth though not especially impressive. The vocal pieces, not done live, sound significantly cleaner and more natural, the voice sweet and clear. Not unexpectedly, the two concertos come complete with a disfiguring outburst of applause at the end of each. Incidentally, there's one oddity about DG's labeling of the album: Neither the booklet cover nor the jewel-box spine mention the music involved. They only name the composer and the artist, Ms. Grimaud. I guess you are supposed to know instinctively (or simply remember) what Ms. Grimaud is playing on the disc once you've set it on your shelf. Or maybe the folks at DG figure people don't really care what Ms. Grimaud is playing, only that she's doing it. 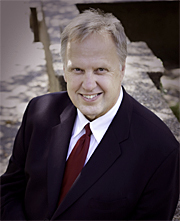 North Bethesda, MD, November 1, 2011 – In celebration of the holidays, National Philharmonic Chorale Artistic Director Stan Engebretson will conduct the National Philharmonic in Handel's Messiah on Saturday, December 10 at 8 pm and Sunday, December 11 at 3 pm at the Music Center at Strathmore. The concert will feature the National Philharmonic's nearly 200 voice all-volunteer Chorale, as well as soloists Jennifer Casey Cabot (soprano); Kendall Gladen (mezzo-soprano); Matthew Smith (tenor); and Kevin Deas (bass). Handel's Messiah, among the most popular works in Western choral literature, was first performed in Dublin on April 13, 1742. The composer's most famous work is divided into three parts that address specific events in the life of Christ. Part one is primarily concerned with the Advent and Christmas stories; part two chronicles Christ's passion, resurrection, ascension and commitment to spreading the Christian message; and part three is based primarily upon the events chronicled in the Revelation of St. John. The National Philharmonic and Chorale, in addition to a stellar cast of soloists, will perform the complete work, which includes such favorites as "The Trumpet Shall Sound," "And the Glory of the Lord," and, of course, the famous "Hallelujah Chorus." A free pre-concert lecture will be offered at 6:45 pm on December 10; at 1:45 on December 11 in the concert hall at the Music Center at Strathmore. To purchase tickets to National Philharmonic's concerts on December 10 and 11, please visit nationalphilharmonic.org or call the box office at (301) 581-5100. Tickets are $32-$79; kids 7-17 are FREE through the ALL KIDS, ALL FREE, ALL THE TIME program (sponsored by The Gazette). ALL KIDS tickets must be purchased in person or by phone. Photo credit for National Philharmonic Chorale Artistic Director Stan Engebretson is Jerry Fernandez. NEW YORK, NY – First-Prize Winner of the 2011 Cleveland International Piano Competition, German-born pianist Alexander Schimpf makes his New York debut at 7:30pm on December 5, 2011 in Carnegie Hall's Zankel Hall. Selected from a field of 28 pianists from 11 countries, Mr. Schimpf received a cash award of $50,000 and more than 50 worldwide engagements, including a December 5, 2011 Zankel Hall recital. Mr. Schimpf's largely German program includes works by Bach, Brahms and Schubert as well as two works - one a world premiere - from young German composer Adrian Sieber. Mr. Schimpf's Zankel Hall program displays a great affinity for his Germanic musical heritage beginning with Bach's English Suite No. 3 in G Minor followed by Brahms's Ballade No. 4 in B Major, Op. 10 and two works by Adrian Sieber, Fantasie II, a work Mr. Schimpf performed during the 2011 Competition, and the world premiere of Sieber's …und schon verglüht (…and already in embers) written for the pianist. Schubert's Sonata in B-flat Major, D. 960 concludes the program. Born in Gottingen, Germany in 1981, Alexander Schimpf initially studied piano with Wolfgang Manz in Hannover, and subsequently attended the Musikhochschule Dresden with Winfried Apel and the Musikhochschule Wurzburg with Bernd Glemser. Pianists Ceclile Ousset and Janina Fialkowska also played an important role in his artistic development. 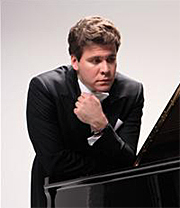 In addition to the Cleveland Competition, Mr. Schimpf won First Prize at the 2008 German Music Competition in the solo piano category, as well as the 2009 Beethoven Competition in Vienna. He was awarded the Audience Prize by vote of those in attendance at the final round of the Cleveland Competition. Admission: $15, $10 for students and seniors. Tickets on sale at www.carnegiehall.org, CarnegieCharge at 212-247-7800 and at the Carnegie Hall Box Office. chamber choir and one of several performing ensembles of the National Philharmonic. area and its repertoire covers five centuries. nationalphilharmonic.org for call 301-493-9283, ext. 116. Assembling a family of noteworthy musicians and teachers, The Music Institute of Chicago presents a Vamos Family Concert Saturday, December 17 at 7:30 p.m. at Nichols Concert Hall, 1490 Chicago Avenue, Evanston. Playing a program of Chopin's Cello Sonata in G Minor, Poulenc's Violin Sonata, and Bach's Concerto for Three Violins in D Major, Vamos family members are recipients of numerous honors and have performed widely to great critical acclaim. Wife and husband Almita (violin) and Roland Vamos (conductor), both members of the Music Institute's violin faculty (Roland also serves on the viola and chamber music faculties and conducts the Music Institute's Senior Academy Orchestra), have received multiple Presidential Excellence in Teaching Awards and launched the careers of numerous individual musicians and renowned chamber groups, including Rachel Barton Pine, Jennifer Koh and several members of the Grammy Award-winning Pacifica Quartet, including their son Brandon Vamos, cello, and his wife Simin Ganatra, violin, who join them on this program. Also performing are Almita and Roland's son Rami Vamos, guitar, and his wife Nurit Pacht, violin, as well as Almita's sister Eugenia Monacelli, piano. Also, "Arpeggione" Sonata; "Notturno" Adagio. Jos van Immerseel, fortepiano; L'Archibudelli: Vera Beths, violin; Jurgen Kussmaul, viola; Anner Bylsma, cello; Marji Danilow, double bass. Newton Classics 8802087. I'm sure there are as many "Trout" in the music catalogue as there are fish in the sea. Sometimes we wonder why record companies keep releasing the same warhorses over and over, but in the case Schubert's Piano Quintet in A, D667, one can understand the justification for so many releases. The work continues to sparkle with a freshness that that never fails to enthrall listeners. 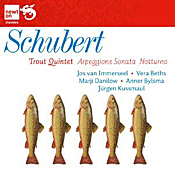 Regarding the present "Trout," Jos van Immerseel and company recorded it on period instruments some years ago for Sony Classics, and the folks at Newton Classics are now reissuing it in their own transfer. It's a worthy re-release in a crowded and highly competitive field. Austrian composer Franz Schubert (1797-1828) in his short life wrote some of the happiest, most-felicitous, and most-moving music the world has ever known, with his "Trout" Quintet (written in 1819 but not published until a year after his death) among the most cheerful, and most challenging, of the lot. People called it "The Trout" early on because Schubert based the final movement on a series of songs, lieder, he had written some years earlier, variations known as "Die Forelle" or "The Trout." Immerseel on fortepiano and the period-instruments ensemble L'Archibudelli provide a lively interpretation of the work, even if one is immune to the charms of period-instruments bands. Note, however, that one would never know this was a period-instruments recording from just reading the jewel box if one didn't notice the word "fortepiano" next to Immerseel's name or already know that Immerseel and L'Archibudelli play on period instruments. Newton Classics say nothing of the matter on the disc, the booklet, or the booklet insert. Of course, you might notice once you started listening to the music: a fortepiano sounds slightly less resonant than a modern piano, and gut strings, period tuning, and older performing practices sound different from modern ones. Anyway, Immerseel and company take this "Trout" in a more vigorous fashion than most other performers do, with energetic rhythms and sprightly accents well punctuated. While it is hardly the leisurely, charming "Trout" we hear from musicians like Alfred Brendel et al (Philips) or the augmented Beaux Arts Trio (Philips or PentaTone), two of my favorites, Immerseel's reading has its own delights, at least if you like fast speeds. Personally, I prefer the more leisurely approach. So, just how quick is this reading? The only other period-instruments version I had on hand was from members of the Academy of Ancient Music on L'Oiseau-Lyre, and in every movement Immerseel and his companions are faster. Needless to say, compared to modern accounts, such as those from the aforementioned Brendel and Beaux Arts, Immerseel is practically a speed demon. Under Immerseel's direction, the first movement, an Allegro vivace, shows much life and animation, while at the same time a sensitive flow of melodies. The next movement, the slow Andante, may not be as graceful as we hear it in many other renderings, but it is still quite lovely and lyrical. The Scherzo: Presto is particularly forceful, although the actual dynamics--the range between the softest and loudest passages--is not particularly wide, which may be one of the disc's only failings. The performers tend to play almost everything at the same level, without as much contrast as in others' hands. Nevertheless, it is fetching in its way. The central Variations are as delightful as ever, despite their brisk tempos, and I might say the same for the finale. Schubert's indication for the last movement is Allegro giusto (cheerful, joyful, usually fast, and fitting or just right), which is a pretty general tempo marking, allowing for a lot of interpretative leeway. At least we know Schubert wanted something a little fast and lively, and he gets it here, the performers playing with more-than-enough gusto. The next of the program's couplings is the Sonata in A minor, D821, for piano and cello, also called the "Arpeggione Sonata" because Schubert wrote it for an instrument called the arpeggione. Unfortunately, shortly after he wrote it the instrument went out of style, and today performers usually play it on the cello. Anner Bylsma plays it on a violincello piccolo. The piece is largely grave in nature, with occasional lighter moments. The Adagio in E flat, D897, "Notturno," for piano trio that closes the show is sweetly melancholic and regal at the same time. It's a neat combination. Where this release scores over many of its competitors is its recording, made in July, 1997, in Lutherse Church, Haarlem, the Netherlands. It captures a genuine sense of air and space around the instruments without ever sounding bright, forward, or edgy. Indeed, if it errs at all, it's on the side of being a tad too smooth and warm. The stereo spread is broad enough to indicate a modest distance, yet the clarity and impact of the music never appear too compromised. I'm not sure how well received this recording of the "Trout" was when Sony first released it, but it certainly deserves this second chance on Newton Classics. It strikes a generally happy chord and brings a smile to the lips. 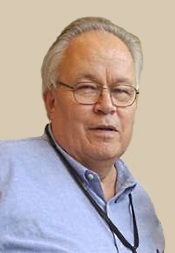 Kurt Sanderling, Symphonieorchester des Bayerischen Rundfunks. Profil PH05020. Maestro Kurt Sanderling began his musical career in 1931 and worked steadily in the field, mostly as a conductor, until he announced his retirement in 2002. He was a contemporary of almost every important musician of the twentieth century, he recorded a huge number of works for various labels, and his name is familiar to most classical-music listeners. It's surprising, then, that he was never fully able to break into the highest echelon of musical geniuses. Perhaps this recording of Bruckner's "Romantic" Symphony provides a clue. While everything about the performance is in place, it never seems to take off, to soar, to inspire the way others do. The Fourth was Bruckner's only program symphony, with the composer telling us what he intended each movement to represent, from knights riding out of a medieval castle at dawn to the sounds of the forest and birds to a hunting song and large-scale summary in closing. More important, the symphony is one of Bruckner's most-beloved works, probably because of its easily communicated grandeur and nobility of spirit. Bruckner was, above all, a profoundly spiritual man, and his music illustrates that spirituality. 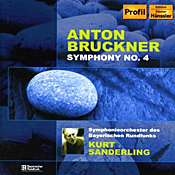 Yet Sanderling's interpretation never quite reaches the pinnacles of grand otherworldliness that other conductors of his generation attained in their recordings, people like Otto Klemperer (EMI), Karl Bohm (Decca), and Eugene Jochum (DG). A prominent mid-to-upper bass rise in the sound and a decidedly slow and calculated tempo provide Sanderling's reading with a degree of gravity, but they also tend to darken and deaden the work's tensions. The Scherzo comes off best, yet even here we find more robustness in the other performances I've mentioned. The Profil label is stingy with their recording details, saying in the booklet insert only that THS Studio restored the sound and citing a date of 1994. I assume 1994 was the recording date, and by the number of coughs and wheezes I heard, maybe it was live. Or maybe the orchestra was having an off day. Anyway, the sound does favor the mid-to-upper bass, as I say, although it isn't enough to mask too much detail. The high end is fine, if not particularly extended, and the midrange is adequate. The stereo spread seems constricted a tad, but it will still fill up your listening room. Incidentally, of the three comparison discs I listened to, the Klemperer sounds the most transparent. EMI always did take care with their productions. Also, Legend; First Rhapsody; Pastoral; Indian Summer; A Sea Idyll; Three Dances. John Lenehan, piano; John Wilson, Royal Liverpool Philharmonic Orchestra. Naxos 8.572598. I've sometimes wondered over the years why record companies regularly ignore many perfectly delightful, accessible pieces of music in favor of old warhorses or modern experiments. The Piano Concerto in E flat by English composer John Ireland (1879-1962) is a case in point. I can remember hearing only one other recording of it, a long time ago with Boult conducting, I believe, and liking it quite a lot. Yet, as with so many things over time, the memory fades, and until reviewing this new Naxos disc I had almost forgotten how charming the work is. Ireland wrote the Piano Concerto in 1930 and dedicated it to his piano pupil Helen Perkin, a young woman who premiered the piece and with whom he apparently fell in love. He then began a second piano concerto, completing only the movement we find later on the disc, Legend, also dedicating it to Perkin. Unfortunately for Ireland, Perkin did not return his affections, subsequently marrying someone else, and Ireland withdrew both dedications. Kind of a sore loser, I suppose. 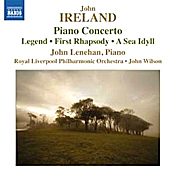 Anyway, the Piano Concerto exhibits Ireland's romantic impressionism, and as played by pianist John Lenehan, conductor John Wilson, and the Royal Liverpool Philharmonic, the music expresses good cheer, poetic yearning, and eloquent aspiration. Its three relatively brief movements move seamlessly from one to the next, the whole work essentially a love poem. The opening movement, marked "In tempo moderato," sets the tone for a piece that infuses a bit of Gershwin jazz with Brahmsian rhapsody. There is also a kind of free-spirited, freewheeling quality to the music making, nicely captured by Lenehan and the orchestra. The slow, middle section is really quite ravishing, a warmhearted duet between piano and players that clearly demonstrates the composer's fondness for Ms. Perkin, punctuated by an emphatic climax before leading directly into a final movement of much vitality. Naxos couple five other works by Ireland to the Piano Concerto, and although they may not possess the same radiant distinction, they are worthy of a listen. Two of them, the early Pastoral and the later Indian Summer Naxos give world-première recordings. The Legend for piano and orchestra (1933) comes next, and while Ireland may have intended it as a follow-up to his highly successful Piano Concerto, it is very different in mood. Instead of being cheerful and buoyant, it is rather dark, even gloomy, perhaps a musical picture of the West Sussex countryside he loved so much that he eventually retired there (in a converted windmill, no less). In any case, after its ominous beginnings, the work turns somewhat lighter, and Lenehan brings out the beauty in it. The final pieces are for piano only, starting with Pastoral (1896), newly uncovered, a short piano work done when Ireland was still a student. The even shorter Indian Summer (1932) that follows is another landscape painting; A Sea Idyll in three movements is enchanting, with an air of Debussy about it; and the Three Dances that close the program are simple, bouncy, and bucolic in nature. Again, Lenehan does justice to all of the music. One of the best recordings from Naxos I've heard in quite some time, they made it in the Music Room at Champs Hill, West Sussex, and at Liverpool Philharmonic Hall, England, between 2007 and 2011. While the piano is well out in front of the orchestra on the two piano and orchestra pieces, the stage depth and stereo spread are impressive. The sound is perhaps a touch soft, yet probably no more so than one would find in a live performance, with a smooth, fairly dynamic response. At no time during the piano and orchestra recordings or in the piano solos is the sound ever edgy, harsh, or bright nor clouded or veiled. It is, in fact, just right for easy listening. On a final note, I would point out the disc contains some seventy-seven minutes of music, a healthy dose for so low a price. Thank you, Naxos. Bach Reimagined. 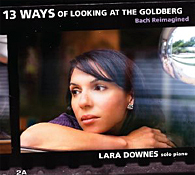 Lara Downes, solo piano. Tritone Records. German composer and organist Johann Sebastian Bach (1685-1750) published his Goldberg Variations, BWV 988, in 1741 as an aria and thirty elaborations on the theme for harpsichord. The present album attempts to do Bach one better by offering variations on the Aria by thirteen of today's leading musicians. Whether you think they did any better than Bach did, you'll have to decide for yourself as American pianist Lara Downes plays them in this world-premiere recording from Tritone Records. The Irving S. Gilmore International Keyboard Festival commissioned these reimaginings of the Goldbergs in 2004, the thirteen composers including Fred Lerdahl, Bright Sheng, Lukas Foss, Derek Bermel, Fred Hersch, C. Curtis-Smith, Stanley Walden, Ryan Brown, Mischa Zupko, David del Tredici, William Bolcom, Ralf Gothoni, and Pulitzer-Prize winner Jennifer Higdon. Ms. Downes's own inspiration, as she recounts it, was the 1955 recording of the Goldbergs by the eccentric-genius pianist Glenn Gould, so she's well aware of what others have done with the piece. The present composers come at the Goldberg from all directions, some of them sounding a lot like the composer himself, some of them clearly jazz influenced, some of them modern and atonal, some of them just a tad whimsical. There's a little something for everybody here, with Ms. Downes playing each of them with equally loving care. For instance, the program begins with the Bach Aria itself, which I liked best of all, Ms. Downes's playing sensitive and moving. Next up, Fred Lerdahl's restructuring bears little resemblance to the original, and it's happy and bouncy. Jennifer Higdon takes things even faster, yet it's still playful. Bright Sheng prefers a slower, almost spookier attack, making a nice contrast with the sprightliness of what went before. And Lukas Foss gives us a delicate approach, which seems closer to Bach with a little Debussy thrown in. Derek Bermel updates the piece to the twenty-first century in the imaginatively titled Kontraphunktus, perhaps a play on "contrapunctus," Latin for counterpoint; that's followed by a lyrically flowing version by Fred Hersch. The cutely designated Rube Goldberg Variation by C. Curtis-Smith is as clever as its name. Then Stanley Walden's account comes crashing down on us from another plane altogether. As the program alternates slower, faster, louder, and softer variations, we next get Ryan Brown's Ornament, a piece notable for the apparent simplicity of its progression and Ms. Downes's responsive handling of it. After that is Mischa Zupko's turn, who gives us a dark, heavy treatment; David del Tredici with a wispy, romantic turn; William Bolcom with a felicitous one; Ralf Gothoni with a faux-baroque ornamentation; and finally a reprise of the original. It's quite a fascinating collection, actually, one we have Ms. Downes to thank for. The album ends with three favorites of Ms. Downes: Dave Brubeck's Chorale, from his Chromatic Fantasy Sonata; Lukas Foss's Prelude in D; and J.S. Bach's Sarabande, from his French Suite V, BWV 816. Of the final three, it's still the music of Bach that fills me with the most joy, even if there is no denying the appeal of the more-modern material. Recorded at Patrych Sound Studios, the Bronx, New York, in 2011, the piano sound is gentle and smooth, a bit reverberant, with good body and impact. The engineers miked it at a moderate distance to provide some studio ambience but not so distant as to obscure detail. More important, it doesn't stretch the piano across one's living room. Two minor, nonmusical annoyances, though: First, the packaging is one of those Digipaks that unfolds into four sections like a road map, making it cumbersome to handle and read. Second, the disc case lists the track timings in a font so small and a color so faint against a dark background, one can hardly read them. As I say, minor quibbles. Maestro Artist Management (MAM) is pleased to announce their latest line-up of world class classical artists and orchestras to visit major markets in the U.S. in early 2012. Denis Matsuev, Vladmir Spivakov with Olga Kern, Vadim Repin with Itamar Golan, and the Moscow Soloists Chamber Orchestra with conductor/soloist Yuri Bashmet featuring cellist Mischa Maisky will all be presented by MAM in the nation's most prestigious concert halls across the country. State MAM founders Maria Shclover and Irina Shabshis: "Our announced season offers something for everyone, most especially our very discerning classical music audience. Every season, we strive to introduce U.S. audiences to the best and most prominent international talent, and we are certain that these upcoming performances will delight music lovers from coast to coast." Virtuosic pianist Denis Matsuev returns to the U.S. with a recital program of Schubert, Beethoven, Grieg and Stravinsky, while the magnetic duo of violinist Vladmir Spivakov and pianist Olga Kern promise to delight with Brahms, Stravinsky, Pärt and Franck. David Finckel (cello) of the celebrated Emerson String Quartet will join Spivakov and Kern for the performance of Dmitri Shostakovich's Piano Trio No. 2 in E Minor, Op.67 at Carnegie Hall only. Ranking among the most prominent classical artists in the world today, Vadim Repin and Itamar Golan will perform a recital program of works by Janacek, Ravel, Grieg and Chausson. Celebrating their 20th anniversary, the Moscow Soloists Chamber Orchestra, conducted by Yuri Bashmet, will make a triumphant visit to the US featuring cellist Mischa Maisky, who will make his first appearance on a major U.S. tour in almost 20 years. The orchestra will present works by Schubert/Mahler, Hayden, Tchaikovsky and Brahms. Maestro Artist Management http://www.maestroartist.com is a full-service production, touring and promotion company that focuses on presenting international artists in a variety of genres, from classical music and dance, theatre and world music to audiences in the U.S. Founded by passionate arts enthusiasts Maria Shclover and Irina Shabshis, MAM's vision is focused on creating an ongoing dialogue between American audiences and international artists with the goal of promoting greater cultural understanding. They are strongly committed to providing the finest entertainment, exceptional musical performances and enlightening educational programs for their patrons, and bear an impassioned belief that shared musical experiences enrich the lives of our community by stimulating cultural awareness and celebrating artistic achievements. To encourage and promote the development of young composers ages 12–18, the Music Institute of Chicago is sponsoring the Generation Next Young Composer's Competition. Prizes range from $75 to $350. In addition, winners will hear their works performed live at Nichols Concert Hall, receive a CD recording of the performance and become eligible for scholarships to participate in the Music Institute's Composer's Lab. While there are abundant performance opportunities and competitions for young musicians, there are far fewer opportunities to recognize talented young composers. In an effort to stimulate interest in the music of our time and support young composers in their endeavors, the Music Institute began the Generation Next Young Composer's Competition in 2006. Each year talented young musicians from the Music Institute's Academy and Community School programs perform the winning works at Nichols Concert Hall in Evanston. This year the Winner's Concert takes place March 9, 2012, as part of MIC's annual Four Score Festival. In addition to performances of the winner's composition, the program also will feature works from the Music Institute's Composer's Lab Program, created by Composer-in-Residence Mischa Zupko, and performances by young composers from the studio of Chicago-based composer Dr. Stacy Garrop. The Music Institute again has partnered with 98.7 WFMT to record the performance for future broadcast on the popular radio program Introductions, which celebrates talented pre-college classical musicians. "this was written by hand" is a 10-minute piece for solo piano. The inspiration for the piece came from the physical process of writing music. "Writing music [used to be] an intensely physical activity," Lang muses in the album's liner notes. "I got my first computer in 1993, and I have not written music with a pencil ever since, but I wonder how - or if - the means of my writing had any effect on the writing itself. I wrote this piano piece to find out." The second part of the release is the eight-sectioned "memory pieces." Each was written to honor a friend of the composer who have passed away. They serve, however, less as monument than as an attempt to enclose a specific memory about the loved one. Lang explains, "Each of these little pieces highlights some aspect of my relationship with each friend. I hope this will help me hold on to these memories just a little while longer." One of the works on the album, "wed," is at the center of an online contest. The sheet music for "wed" will be available for free here on November 15, and users are invited to download it. Pianists can then post videos of themselves playing the work onto YouTube with the tag "david lang piano competition 2011." After January 1, all of the submissions will be judged by an all-star pianist panel consisting of Vicky Chow, Jeremy Denk, Lisa Moore, Andrew Zolinsky, and the composer himself. The winner will be flown out to New York, and Lang will compose a new work for four hands to be played by him/her and Zolinsky at (le) poisson rouge on May 6. The winner will also play his or her rendition of "wed" at (le) poisson rouge. The full rules can be found here. The contest is an attempt to recreate a lost part of classical music. Lang says, "One of the things I have always loved about piano music is that for a long time it was the most democratic part of the classical music world. 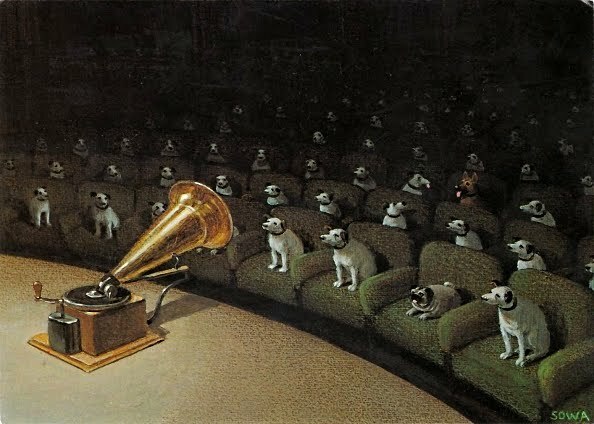 In the 19th century--the glory years of classical music--if you wanted to hear music in your home you would have to play it yourself, and many people became acquainted with famous operas or symphonies only from the piano transcriptions that they could play themselves, in their own homes. Good pianists, bad pianists, amateur pianists, virtuosi - anyone interested in the music found out about it by playing it, or at least trying to. When I put the pieces together on this disc I started wondering if there were some way to engage that same wide range of listeners and performers and abilities, so I thought up this contest. Of course I hope that some people will submit their videos, but what makes me most excited is the hope that many more people will download the free sheet music and play the piece themselves. That makes me really happy." The 2011-2012 season continues the proliferation of David Lang's vision. October will see the premiere of "reason to believe" with the Trio Mediaeval and Norwegian Radio Symphony, and Lang as the featured composer at the Bowling Green New Music Festival. "the little match girl passion" will be performed by the Los Angeles Master Chorale at Disney Hall on November 13. Also in November, the UK theater company Cryptic begins a tour of an evening-length work, dramatizing Lang's pieces "the little match girl passion" and "world to come." On December 2, anonymous 4 will premiere "the wood and the vine," which will tour the world as part of the company's 25th anniversary tour. Cantaloupe will also release Lang's soundtrack for the award winning documentary The Woodmans, in conjunction with its national broadcast on PBS this December. 2012 begins with a new work commissioned by Stanford Lively Arts and Carnegie Hall for Bryce Dessner, Owen Pallett, Shara Worden, and Nico Muhly in Stanford, California, and Zankel Hall in Carnegie Hall. Lang will be a featured composer at the festival Les Subsistances in Lyon, France February 3 through 7, 2011. The season will continue with the American premiere of "I never" at Sacred Music in a Sacred Space on March 28. In April will be the premiere of Pontus Lidberg's choreography to "the little match girl passion" sung live, at the Royal Swedish Ballet. Ludovic Morlot leads the BSO in Mozart's Piano Concerto No. 25 with American pianist Richard Goode, Elliott Carter's Flute Concerto with BSO principal flutist Elizabeth Rowe, Berlioz's Roman Carnival Overture, and Bartok's Miraculous Mandarin Suite, December 6. With these BSO Davies Hall programs--part of a season-long celebration by the San Francisco Symphony of its 100th anniversary--the BSO kicks off its West Coast tour, to include additonal stops in Santa Barbara, Palm Desert, and Los Angeles. The Boston Symphony Orchestra's five-concert West Coast tour under the direction of Ludovic Morlot begins with its eagerly anticipated return to San Francisco after a 15-year absence for two performances in the San Francisco Symphony's Davies Hall, December 6 and 7, 2011, as part of the SFS's celebration of its 100th anniversary. Mr. Morlot, who started his appointment as Music Director of the Seattle Symphony Orchestra this past September and is also Chief Conductor Designate of La Monnaie, the famous opera house in Brussels, makes his Davies Symphony Hall debut with these BSO programs. To kick off their West Coast tour on December 6, the Boston Symphony Orchestra welcomes two distinguished American musicians to the stage—Richard Goode, a frequent BSO collaborator who will perform Mozart's Piano Concerto No. 25 in C, K.503, and BSO principal flute Elizabeth Rowe, who will be the featured soloist in Elliott Carter's Flute Concerto, the American premiere of which she performed in January 2010 at Symphony Hall in Boston. This concert opens with one of the BSO's signature overtures, Berlioz's Roman Carnival Overture, and ends with Bartók's Miraculous Mandarin Suite, a BSO audience favorite, first performed by the orchestra in the 1950s, and subsequently performed many times since, with Seiji Ozawa, the BSO's music director from 1973-2002, having led the work several times during his 29-year tenure. Also, Czech Suite; Slavonic Dances. Jose Serebrier, Bournemouth Symphony Orchestra. Warner Classics 2564 66656-3. 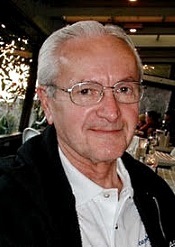 Maestro Jose Serebrier has been leading and recording orchestras for close to fifty years, making him one of the old guard among current classical conductors. By his own count, he has recorded the music of Czech composer Antonin Dvorak (1841-1904) at least three or more times in the past, so he knows what he's doing. 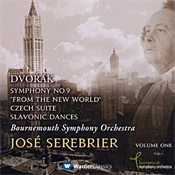 Now, he embarks on a complete Dvorak symphony cycle for Warner Classics, beginning with this disc of the Ninth Symphony and several accompanying works. The program opens with Dvorak's Slavonic Dance No. 1, Op. 46, which gets things off to an energetic start. This was one of the composer's early successes, inspired as he was by Brahms's Hungarian Dances and urged to do so by no other than Brahms himself. Serebrier does a commendable job maintaining the work's forward thrust. The centerpiece of the album, though, is the Symphony No. 9 "From the New World." Many listeners over the years seem to hear instances of American idioms in the music, when in fact most of it Dvorak said was entirely original. Its title, "From the New World," really only came about because Dvorak happened to be living in New York at the time he wrote it. While to some small degree local tunes may have inspired the composer, the music is clearly Czech in flavor. At the very least as Leonard Bernstein once remarked, one might consider it multinational. Whatever the case, Serebrier zips through the first movement with a healthy conviction, ushering in an even quicker-paced Largo than one usually hears. It's still quite lovely, if a little on the perfunctory side. The conductor has a good time with the Scherzo, keeping it light and airy while still generating a good deal of excitement. However, both the composer and the conductor save up their big guns for the finale, which brings the work to a happy and jubilant close. Unfortunately, there are quite a few rival recordings, and with this one you'd really have to want the couplings to make it competitive. Otherwise, you might be better off with any one or more of my own favorites: Kertesz and the LSO (Decca), Reiner and Chicago Symphony (RCA or RCA/JVC), Dorati and the New Philharmonia (HDTT), Kertesz and the Vienna Philharmonic (London), Macal and the LPO (EMI), Neumann and the Czech Philharmonic (Denon), Kubelik and the Berlin Philharmonic (DG), and Alsop and the Baltimore Symphony (Naxos) among others. Now, speaking of couplings, the program concludes with the Czech Suite, Op. 39, followed by the Slavonic Dance No. 2, Op. 72, both of them showing plenty of color and rhythmic flair. In particular I thought the lyric simplicity and lilting beauty of the Suite was enough to make exploring the disc worthwhile. Recorded at the Lighthouse, Poole Arts Centre, Poole, Dorset in 2011, the sound is notable for its high-end sheen and fairly transparent midrange. It suffers slightly from an undernourished low end, though not by much, and a touch of treble harshness. So, the balance is just a tad off, while the clarity is exemplary. I had hoped for a bit more orchestral depth, too, made up for by a smooth upper bass and a pleasant sense of resonant bloom. Overall, the sound is reasonably realistic and brings much enjoyment. Also, Violin Concerto; orchestral and chamber works. Elmar Oliveira, violin; Leonard Slatkin, St. Louis Symphony Orchestra. EMI 7243 5 86561 2 (2-disc set). I mean no disrespect to a fine conductor, but I have not always found Maestro Leonard Slatkin's musical interpretations to be in the uppermost ranks of great performances. Perhaps this is unfair, given that the competition among truly great conductors is so easily accessible on disc. But in the orchestral works of American composer Samuel Barber (1910-1981), Slatkin comes into his own, and there probably isn't another conductor, short of Leonard Bernstein, who illuminates the composer's music so felicitously. 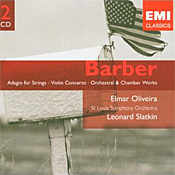 This two-disc set presents a well-rounded view of Barber's output from youth to old age. Among my favorites are, of course, the famous Adagio for Strings as well as the three Essays for Orchestra. The Adagio goes without saying, and Slatkin's slow, measured, and totally affectionate reading of it is one of the best on record. The Essays date from the 1930s, 1940s, and the late 1970s, thus reflecting three phases in the composer's life. Actually, the contrasts are not as striking as the similarities; all three are lightweight but delightful. Well, OK, most of Barber is lightweight, but that's beside the point. The Violin Concerto is especially light, but it too is given over at times to some lovely melodies. While Slatkin and his St. Louis players handle the orchestral duties, on disc two we find a number of smaller solo, duet, and quintet pieces (concluding with Slatkin again and the Third Essay for Orchestra). I didn't care much for the Cello Sonata, but in Excursions, Nocturne, Summer Music, and Souvenirs, we find delectable Impressionistic echoes of Debussy, Delius, and Satie. The music doesn't always go anywhere in particular, but like a pleasure ride in the country, the trip itself is worth one's time. EMI recorded the purely orchestral sections in the mid to late Eighties, and they recorded smaller works in the mid Nineties, all in digital. I can't say any of it is the best sound I've ever heard, but it surely fits the relaxed mood of most of the music. I had about a half a dozen recordings of the Adagio on hand for comparison, almost all of them sounding clearer, sharper, and more detailed than Slatkin's account. Yet despite the softer, warmer acoustics of the EMI recording, the Adagio and the other pieces with the St. Louis Orchestra sounded just right to me. A deep bass and some clean midrange and highs are quite radiant as they beam through the mid-bass fog. The solo pieces tend to come off best, but, as I say, there is nothing seriously wrong with any of the sonics. The set offers the listener a pleasant, useful, and inexpensive way to get acquainted with an American original. La Folia (Madness) & other concertos. Jeannette Sorrell, Apollo's Fire Baroque Orchestra. Avie AV2211. 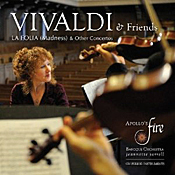 Harpsichordist and conductor Jeanette Sorrell formed the period-instruments orchestra Apollo's Fire in 1992 in order to create a new baroque orchestra in Cleveland. 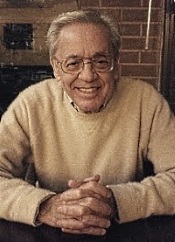 As the booklet note observes, "Sorrell envisioned an ensemble dedicated to the baroque ideal that music should evoke the various Affekts or passions in the listeners. Apollo's Fire, named after the classical god of music and the sun, is a collection of creative artists who share Sorrell's passion for drama and rhetoric." Certainly, in this collection of baroque and modern music there is no want of creativity or drama, starting with an Iberian dance number by Vivaldi, followed by several transcriptions, and concluding with a recent partial tango, of all things. So, it's a diversified program, one that may be intriguing to some listeners or gimmicky to others. One cannot, however, say it's ordinary. Things start out with the Concerto grosso, La Folia, arranged by Jeannette Sorrell after Vivaldi's Sonata Op. 1, No. 12. It's the aforementioned Iberian dance, with Moorish influences, a popular form all over Europe in the composer's day. Sorrell's arrangement allows all thirty or so of the players in Apollo's Fire to join in the fun. Despite the music being lively, Sorrell never takes it too fast, keeping it, as is her wont, to a moderate tempo. Nevertheless, the interpretation shows plenty of vitality and kicks off the album in fine style. Next, we get Vivaldi's Concerto in B minor for Four Violins, Op. 3, No. 10, RV 580. Later in the program we'll hear Bach's transcription of it for four harpsichords. Here, however, we get to enjoy the interplay among the four string instruments. After that comes Vivaldi's Summer Concerto from The Four Seasons in an arrangement by Sorrell that replaces the solo violin with her at solo harpsichord. Apparently, it was a widespread practice in the baroque period to transcribe string works for keyboard presentations. Whatever, the result is unique and worthy of a listen. Insofar as the reading goes, though, it seems fairly traditional, with a strong third-movement Presto that brings the music to a rousing close. Vivaldi's Concerto in G minor for Two Cellos, RV 531 follows, exhibiting good color and several exotic interludes. Then Sorrell offers the Bach treatment of Vivaldi's Concerto for Four Violins, this time done up for four harpsichords. So, it's Vivaldi via Bach, and you'll hear a little of each composer in the music. The accomplished Apollo's Fire performers make both of the pieces seem entirely different (use your remote to switch back and forth). The program ends with a modern work, the Tango Concerto in D minor for Two Violas da Gamba by Rene Schiffer (aka Rene Duchiffre, b. 1961), which closes with a tango. Why a modern tango, a purely twentieth-century genre, to end the piece? Well, why not? Schiffer writes that it's "because of the dance's signature elements of rhythmic simplicity and harmonic ostinato, which are also characteristic of many baroque dance forms, including the follia." Fair enough. Anyway, Sorrell and her group bring off this faux-baroque music as playfully as the rest of the album. Besides, Schiffer is the ensemble's principal cellist, so why not give him a shot. The producers recorded all of the tracks in St. Paul's Church, Cleveland Heights, Ohio, with the first track done live in 2008. It may be live, but it doesn't really sound it, with only occasional minor noises from the audience. Not too closely miked, the acoustic provides ample space, definition, and air for the instruments to breathe. The other items, done in 2000 and presumably not recorded live, to my ears sound cleaner than the first track, with a slightly more-resonant ambience to the hall and a more-realistic presence all the way around. While there is not too much depth of field here, one can hardly complain about the clarity of the sonics. No disappointments. Piano Music for the Season. Jeffrey Biegel, piano. Steinway & Sons 30005. What would Christmas be without Christmas music? And what Christmas could go by without a slew of new Christmas albums? 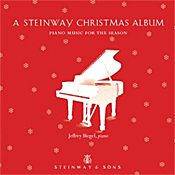 This piano program, A Steinway Christmas Album, from American pianist, composer, arranger, and teacher Jeffrey Biegel is among the most expressive, creative, and delightful of the crop. A rousing rendition of Leroy Anderson's "Sleigh Ride" opens the show and demonstrates Mr. Biegel's dexterous, virtuosic, festive approach to the music making, giving the old chestnut a sparkling new setting. The next two numbers, by Percy Grainger and J.S. Bach, are in contrast to the first selection, producing more soulful, meditative moods. In "Quiet Night" we get a novel arrangement of several perennial favorites, "Away in a Manger" and "Silent Night," written especially for Mr. Biegel in a touching and quite fascinating combination. Then we find Mel Torme and Robert Wells's "Christmas Song" ("Chestnuts Roasting on an Open Fire"), a must in any seasonal collection, but this time Biegel does it up more sensitively than we usually hear it. And so it goes with twenty-one tracks, most of them old standards yet all of them sounding somehow new and different. It's a thoughtful collection that also includes music written or arranged by Tchaikovsky, Liszt, and Reger, plus a number of seasonal classics and a few more-recent ones. Reger's delicate treatment of "Silent Night" and Biegel's extraordinarily lovely interpretation of it exhibit the kind of musicianship you find throughout the album. The entire program is a joy from beginning to end, and I say that without reservation. You couldn't really have an impressive album of piano music without a really impressive recording of the piano, and this one satisfies the order. Recorded in 2011 in the Concert Hall of the Performing Arts Center, Purchase College, State University of New York, the piano sound has a realistic body and resonance. While being fairly close up, it nevertheless reflects an appropriate degree of hall ambience, the acoustic producing a most-pleasant overall effect. To its credit, the music on A Steinway Christmas Album is the kind a person can enjoy all year 'round, not just during the weeks in late December. Jeffrey Biegel is an accomplished concert pianist who presents the tunes as he would any serious classical compositions, with much exuberance, emotion, sensitivity, and good cheer as the case demands. The result is an album for all seasons. New York, NY-- Spring for Music was inaugurated in 2011 in part to spark conversations about repertoire, about audience expectations and about how programming--both adventurous and complacent--affects how we think about classical music. Last May, seven orchestras from across North America performed at Carnegie Hall, pushing the limits of conventional programming and presenting holistic artistic evenings. After a successful first season, the programs for 2012 (found at the end of this press release) were announced, and audiences are eagerly awaiting the new season. Even before Spring for Music 2012's May 7 opening night and second season, however, there is already a lively debate over the 2014 programs. All are invited to voice their opinions. On Spring for Music's Web site, the potential 2014 orchestras have submitted program proposals and written notes explaining their choices, which are posted anonymously. The programs range from an evening of new music showcasing Canada's rising generation of iconoclast composers, to a thematic program centering around suffering and resilience, to a night featuring works about New York and its complicated mythology...by composers not from New York. Comments and debates have sprung up and only aid Spring for Music's goal of opening up questions about programming and starting discussions. Comments on the website range from excitedly positive, "What a wonderful, imaginative program! Must hear and experience this one", to thought-provoking, "I think the theme and the content of this program is particularly relevant and poignant for the times that we are experiencing now in our great country. The message is one of hope and strength; remembering those who have gone before to secure our freedoms and bring optimism for the future", to whimsically specific, "Schafer and Tanya on the same program? Like dark chocolate and merlot...perfect!" To date, there have been more than 3,000 votes and 19,000 visitors. The 2014 programs and orchestras will be announced on February 1, 2012, and potential orchestras will be able to modify their programs based on the website comments before final submission. 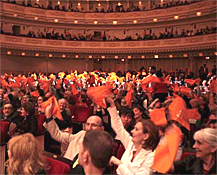 Spring for Music is an annual concentrated festival of concerts by North American symphony and chamber orchestras presented at Carnegie Hall. Six orchestras--the Houston Symphony, Edmonton Symphony Orchestra, New Jersey Symphony Orchestra, Alabama Symphony Orchestra, Milwaukee Symphony Orchestra, and Nashville Symphony--will perform on May 7 to May 12, 2012. Tickets will be priced at $25 throughout the hall. Through a unique marketing structure involving shared costs, shared risks, and generous donations, the festival allows participating orchestras to showcase their artistic philosophies through distinctive and adventurous programming in one of the world's most competitive musical environments. The festival hopes to provide a laboratory, free of the usual marketing and financial constraints, for an orchestra to be creative with interesting, provocative and stimulating programs reflecting its beliefs, its standards, and vision. Paul Lansky: Shapeshifters for Two Pianos and Orchestra (ASO Comission; New York Premiere). Hilary Hahn Announces On-line Contest to Select the 27th Encore for Her "In 27 Pieces: The Hilary Hahn Encores"
New York, NY--At age 31--32 on November 27--Hahn has already made a lasting impact on the violin repertoire, premiering a concerto by Jennifer Higdon in addition to another by Edgar Meyer and championing both well- and lesser- known works in performance and recording. This season, Hahn delves deeper into the world of contemporary classical music, commissioning over two dozen composers to write short-form pieces for acoustic violin and piano. She will tour these new works over the 2011-12 and 2012-13 seasons and then record them. The project is called "In 27 Pieces: The Hilary Hahn Encores." The final, 27th composer will be selected by Hahn from blind submissions on a website. Anyone from anywhere can submit a potential 27th encore. Hahn's goal is to give equal opportunity for participation, and to help create a positive environment in which everyone who is interested in expressing themselves musically can be heard. One Grand Prize winner will be named the 27th composer for "In 27 Pieces: the Hilary Hahn Encores." The Grand Prize winning piece will be programmed on Hahn's 2012-13 recital program with 13 other previously commissioned works for the project; toured around the world; and recorded for release in the 2013-14 concert season. Honorable Mentions (not to exceed ten in number) will also be awarded to the pieces that Hahn finds most compelling besides the Grand Prize winner. These Honorable Mentions will be listed on HilaryHahn.com. For every submission received, $2 will be donated to the music programs of Dramatic Need. The competition is open to composers of all nationalities, with no age restrictions. The compositions submitted for the competition must use both acoustic violin and piano, and nothing else, and may not involve any form of electronic or pre-recorded sounds or vocalizations. The pieces must be between 1.5 and 5 minutes in length, and only completed works will be considered. Each entry must be original music written by the composer, and only one entry per composer is allowed. No changes may be made once a piece is submitted, though the Grand Prize winner will have a chance to make small revisions once the piece is chosen. The submitted compositions must be written specifically for this project and not submitted to any other contest, and must not have been performed, published, or recorded in any form. Submissions will be accepted on the website from November 15, 2011 to March 15, 2012. Each submission must be comprised of a PDF and a MIDI file. Results will be announced on this site on June 15, 2012. For the full list of rules and submission requirements, please visit the website. The idea for "In 27 Pieces: The Hilary Hahn Encores" began to take shape nearly a decade ago, when Hahn noticed that new encore pieces were not being showcased as much as other types of contemporary works. Shorter pieces remain a crucial part of every violinist's education and repertoire, and Hahn believed potential new favorites should be encouraged and performed as well. In a recent interview with the Cincinnati Enquirer, Hahn describes her experiences to date with this project: "What surprised me most is the way each piece represents its composer's specific musical language. I find myself working very hard to get into each composer's way of writing, so that I understand on an innate level how they have structured every aspect of their pieces, from phrases to harmonies and even violinistic techniques. In that sense, this project has been much bigger than I anticipated. But I like challenges." Once a month over the next two years, Hahn will post interviews with the "In 27 Pieces" composers on her YouTube channel. To date, she has interviewed Max Richter, Bun-Ching Lam and Søren Nils Eichberg. Click on the images below to watch. For Immediate Release, October 26, 2011, New York, NY …. Distinguished Concerts International (DCINY), now in its 4th season, proudly ushers in the holiday season on Sunday, November 27 at 2:00pm with the Lincoln Center premiere of Sir Thomas Beecham/Sir Eugene Goossens' 1959 re-orchestration for full Symphony Orchestra of Handel's beloved Messiah. The re-orchestration, which reappeared in 1999 after a 40-year absence, fills the concert hall with the gloriously rich tonal color of a full, symphony orchestra, to the enthusiasm of audiences wherever it is performed. Featured soloists include soprano Sara Jean Ford, currently starring as Christine Daae in Broadway's The Phantom of the Opera, countertenor Nicholas Tamagna, 2011's Nico Castel International Master Singer Male winner, tenor Ryan MacPherson, and bass Michael Scarcelle. DCINY's Artistic Director and Principal Conductor, Jonathan Griffith, leads the Distinguished Concerts Orchestra International and Distinguished Concert Singers International. In 1959, Sir Thomas Beecham, founder and Music Director of London's Royal Philharmonic Orchestra (RPO), commissioned Sir Eugene Goossens to orchestrate Messiah for a full, symphony orchestra. Long before the current Early Music movement had taken hold, Beecham fully believed that unless a work was written for the full force of a modern orchestra, it would not be programmed. After completing the commission - thus supposedly saving the treasured work from oblivion - the new Goossens' orchestration was performed live at the Lucerne Festival in Switzerland and recorded by the RPO. Soon afterwards, however, the score and parts were "lost" and no other live performances of the work were presented in Europe or in the United States. Meanwhile, the recording became a huge hit for RCA Red Label and remains one of the top ten most popular Messiah recordings of all time. Following the first live performance of Goossens' Messiah at Royal Albert Hall in London in 1999, Dr. Jonathan Griffith conducted the United States premiere in April 2000 at Carnegie Hall. While Goossens' epic, romantic take on Handel's masterpiece has somewhat divided critics over the last decade, audiences have responded with unequivocal enthusiasm, as comments Dr. Griffiths: "Even the most novice of audience members recognizes the familiarity of the overall music, but is deeply touched by the sheer sound and richness of full winds, full brass, strings and percussion in those moments that call for musical exuberance, such as the 'Hallelujah' chorus, 'Worthy is the Lamb', and of course, the concluding 'Amen'." From the opening chords of the Overture, the listener is gradually introduced to the color palette of the expanded orchestra, leading from the opening strings and oboe, to a harp and flute duet accompanied by pizzicato strings, to the full brass section, punctuating the final measures. Most poignant is the soprano recitative; 'And lo, the Angel of the Lord came upon them,' where ascending arpeggios played by the harp (originally written for the violins) add a sense of mystery and awe. In another beautiful use of tonal color, Goossens' uses only the woodwind section in selected passages of 'I know that my Redeemer liveth,' adding additional warmth and color to the text. DCINY is pleased to welcome back Sara Jean Ford as soprano soloist, last heard with the company in the role of Pieta in Eric Whitacre's critically-acclaimed Paradise Lost: Shadows and Wings at Carnegie Hall, Chicago's Auditorium Theatre and Walt Disney Concert Hall in Los Angeles. Currently starring as Christine Daae in Broadway's The Phantom of the Opera, Ford also counts Finian's Rainbow and A Little Night Music among her Broadway credits. Rising New York City countertenor Nicholas Tamagna won the Nico Castel International Mastersinger Competition in the male category in 2011 and was recently praised by The New York Times for his "charismatic" and "vibrant" portrayal of Farnace in Mozart's Mitridate for Little Opera Theatre of New York. Tenor soloist Ryan MacPherson has performed frequently with New York City Opera, as well as with opera companies across the country, in roles including Anatol in Samuel Barber's Vanessa and Don José in Carmen. Bass-baritone Michael Scarcelle was recently acclaimed for his Elviro in Handel's Serse with Boston Baroque and performances of Candide with the Munich Philharmonic and on tour with the London Symphony Orchestra. The Music Institute of Chicago presents acclaimed organists from Evanston's houses of worship in concert Sunday, November 13, at 3 p.m. on the gloriously restored, three manual E.M. Skinner pipe organ at Nichols Concert Hall. The Music Institute is presenting this special concert to raise awareness about the scourge of hunger and food insecurity in the community and will contribute 100 percent of the proceeds to support Connections for the Homeless and the Greater Chicago Food Depository. The organ invitational recital benefit takes place Sunday, November 13 at 3 p.m. at the Music Institute of Chicago's Nichols Concert Hall, 1490 Chicago Avenue, Evanston. Tickets are $25 for adults, $15 for seniors, and $10 for students, available at musicinst.org or 847.905.1500 ext. 108.